Following in the footsteps of the hugely popular Raspberry Pi minicomputer The Raspberry Pi 3: Faster, Better, with Wi-Fi and Bluetooth The Raspberry Pi 3: Faster, Better, with Wi-Fi and Bluetooth Today, the Raspberry Pi foundation announced the release of the Raspberry Pi 3. It's the most significant update to the popular line of low-cost computers yet. 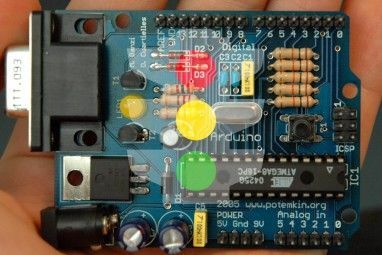 Read More and Arduino microcontroller So You Just Bought an Arduino Starter Kit. What Now? So You Just Bought an Arduino Starter Kit. What Now? 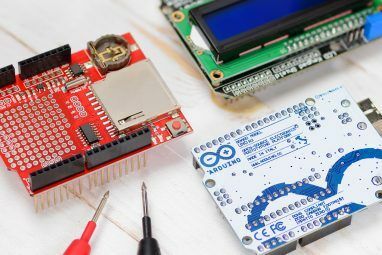 So you just bought your first Arduino starter kit -- or you're planning on buying one soon -- but you don't know where to begin? Don't worry! Read More comes the BBC micro:bit – and yes, we do mean that BBC. Furthering their earlier 1980s involvement in home/hobbyist computing (30 years ago, the BBC Micro computers were a staple across schools and colleges in the UK), this tiny new computer is the result of a surprising number of partnerships. Launched as part of the BBC’s Make It Digital cross-platform initiative, the micro:bit is designed to make it easy for young people — and adult beginners — to get coding and create a whole host of projects, from programming and running games to turning the device into a smart watch. The modest 5x4cm PCB pictured here is the BBC micro:bit, a simple microcontroller that can be programmed on a PC, tablet, or smartphone. The code is then compiled and uploaded to the device. A closer look reveals various annotations pointing to the components, a neat touch on a device intended for learning, where the purpose of onboard components is typically obscured. The USB port is obvious; the Bluetooth LE antenna less so. With five I/O rings for connecting devices, it’s clearly even more basic than a Raspberry Pi Zero Getting Started with Raspberry Pi Zero Getting Started with Raspberry Pi Zero Whether you bought a magazine with one glued to the front, or found a kit online, the chances are you're now the proud owner of a $5 computer: the Raspberry Pi Zero. Read More – but a pair of programmable control buttons, accelerometer, and a 5×5 LED matrix mean that a lot of functionality you would normally need to buy extra bits for is instead available directly on the board, leaving those 5 I/O ports solely for external sensors. Shipping with a battery pack (2xAAA batteries are required), USB data cable, a buzzer, an audio cable, bulldog clips and a USB stick containing pre-written programs and projects, the micro:bit is ready to use when you unpack it. Inside the box you’ll find a nice chunk of literature, including coding tutorials, and the obligatory quick start guide. Ours had a guide for teachers, but once the micro:bit is more widely available we don’t expect you’ll get this particular document. If you want to get more hands-on, the www.microbit.co.uk website is the place to go, where you’ll find video tutorials and resources, along with a range of editors, such as the Code Kingdoms Java Script editor, and Microsoft Block Editor. Projects can be compiled and saved as .HEX files and transferred via USB to the micro:bit. The device can be used with either a PC running Windows 7 or later, a Mac with OS X 10.6 or later, or an Android or iOS smartphone or tablet. Internet access is also required! As useful as a device like this will be for anyone trying to get to grips with coding, the BBC micro:bit – like the Raspberry Pi – is aimed at children, specifically those that are over 8. It also comes with a set of safety instructions that everyone should read and understand, particularly any supervising adults. Our device, therefore, has also been reviewed by a child. This is Caitlyn, who previously got to grips with our Raspberry Pi-driven Kano Kano: The DIY Computer For Kids To Code and Learn (Review and Competition) Kano: The DIY Computer For Kids To Code and Learn (Review and Competition) Can a small child build a computer and learn to code on it? To find out, I tested it on one 3 year old boy with little experience of computers, and his 9 year cousin,... Read More . She’s 11, and has a better understanding of computers; she uses them almost daily for school work. 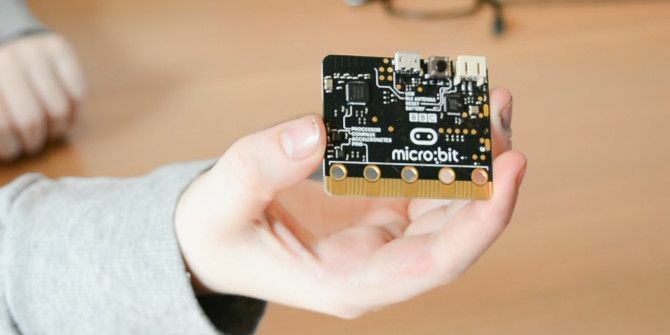 Children can get started with the micro:bit by heading to the website at www.microbit.co.uk, where the all-important Create Code button can be found. The first three come with tutorials, and all four have associated documentation. Getting started is really simple. Here we’ll take a look at Microsoft Block Editor, which can be launched (as can the others) by clicking New Project. On the display, you’ll see a menu on the left, containing a collection of blocks that can be dragged into the main view. These are configurable, and can be used to remote control a smartphone camera or simply manipulate the LED display. By clicking Run on a finished program, you can see a representation of the program in the micro:bit emulator on the right. It’s pretty intuitive. As you can see here, we’ve created a program that displays some text — static and scrolling — when the A and B buttons are pressed on the micro:bit. We first tested it on the emulator, before syncing the compiled file to the micro:bit itself. Many other options are available, and thanks to the simple block-and-loop approach to programming (demonstrated previously by the BBC’s own Doctor Who-flavored The Doctor and The Dalek mobile and browser app), a child of any age can quickly get started with the basics of programming. Incidentally, being a BBC computer project, the presence of their famous Time Lord adventurer can be felt – alongside various other popular BBC shows – in the pre-compiled projects that can be found on the BBC-branded 500 MB USB stick. Here, you’ll find a collection of theme tunes that can be played in glorious 8-bit sound, among them Sherlock, Strictly Come Dancing, the popular Formula 1 motor racing theme tune (Fleetwood Mac’s “The Chain”) and, of course, Doctor Who 50 Things Every Doctor Who Fan Should Know 50 Things Every Doctor Who Fan Should Know Doctor Who, one of the most iconic TV shows of all time, is also a geek favourite. Read More . You can see what the program looks like in script form by clicking Convert — a useful way for youngsters and anyone new to programming to see how a script looks, away from the building blocks. With the compiled HEX file created containing the program, you’ll need to sync it to the BBC micro:bit. This is relatively simple, and can be done by connecting the micro:bit to your PC via USB cable. The initial sync will setup your micro:bit, and requires you to keep a close eye on the LED matrix, where arrows point at the two buttons when they should be pressed, and messages scroll to inform you what to do next. Create your program, via the micro:bit website, then use the compile button to save it as a .HEX file on your computer. This can either be saved in a dedicated directory of micro:bit projects, or synced directly to the micro:bit. Should you want to copy the .HEX file from a directory, simply drag it in your file manager. Don’t worry about these files taking up too much space on your hard drive; they’re tiny, with the music files mentioned above little more than 400 kilobytes each (about the size of a low resolution image, and less than half a megabyte!). As well as connecting the micro:bit to your computer, you can hook it up to your smartphone or tablet. Apps are available for Android (4.4 and above) and iPhone/iPad (iOS 8 and later) devices, and all you need to do is power the micro:bit with the battery pack or USB power supply, and sync via Bluetooth, following the instructions in the app. Both apps seem to be pretty much identical; the screenshots and video clips are from the Android release. From then on, you can access the micro:bit website to get to work on code, or upload any existing code examples included with the app, via the Bluetooth connection. For audio applications, be sure to connect the audio cable to the 0 and GND poles, and a speaker or headset to this. You might also use the buzzer. There is obviously a massive benefit in having the Bluetooth connection to your phone or tablet. The micro:bit app makes the device as portable as a smartphone, and increases its potential as gaming or wearable hardware. Pretty much every kid over 11 owns a smartphone. Wouldn’t you prefer them to be programming their micro:bit rather than wasting time on Snapchat What Your Teen Doesn't Want You To Know They Use Their Phone For What Your Teen Doesn't Want You To Know They Use Their Phone For It's no secret that social media use is rampant among teenagers – but what exactly are they doing when they're staring at their phone or computer all day? Read More ? What Can You Do with the BBC micro:bit? A whole host of projects are available for the BBC micro:bit – the ones in your head as well as those that you’ll find on the website. The tutorial guide introduces a trio of projects: an alarm, a synthesizer, and a raindrop-catching game. Meanwhile, the compact dimensions of the micro:bit mean that the computer remains portable, which means that it can be showed off! “Yeah,” you might be thinking, “everyone’s going to want to stare at a PCB pinned to my breast,” but just remember the 5×5 LED matrix on this programmable PCB. Various 3D printed cases and holders are available (such as this compass), and these can be easily pinned or clipped onto clothing. Could the micro:bit spearhead a revolution in techno fashion? Time will tell, but the devices look surprisingly good pinned to clothing. Just don’t let the BBC micro:bit get wet. The vast number of corporate partners that have got together with the BBC to produce the micro:bit might prove to be a limiting factor long-term, but ultimately this is a useful and educational piece of kit. Explore more about: Arduino, MakeUseOf Giveaway, Micro:bit, Programming, Raspberry Pi. It's pretty cool and interesting!